I've been watching a show on the new Cooking Channel called "Kelsey's Essentials." Kelsey Nixon was one of the contenders on a previous Next Food Network Star show. I don't remember which season. I think the main reason she was knocked out was because she was just out of cooking school and the judges often expressed their thoughts that she was too young. A few years later, she has her own show. And every time she mentions her husband, which is at least once a show, I can't help but think that it's an effort to make her seem older than she is. She also has an annoying habit of using the same few stock phrases over and over again and it damages her credibility. She does know what she is doing, but she tends to say things should be done a certain way because it's better, but she doesn't do a good job of explaining why, in my opinion. And I do not consider myself to be an expert in the kitchen by any means, but so far I have not learned anything new from her. In this week's episode she grilled corn and then coated it with a "Mexican inspired-sauce," as she put it. She mentioned it several times, calling it the Mexican-inspired sauce. And all I could think was, "Oh, the poor sauce, it doesn't have a name." I don't know why, but it bothered me. 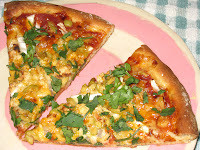 And it stuck in my head, so last night when I went to make pizza with my second pizza crust and realized that I had forgotten to buy more mozzarella cheese, I decided to follow Kelsey's example and make a Mexican-inspired pizza with the cheddar cheese I had in the refrigerator. Whatever you want to call it, it was delicious. 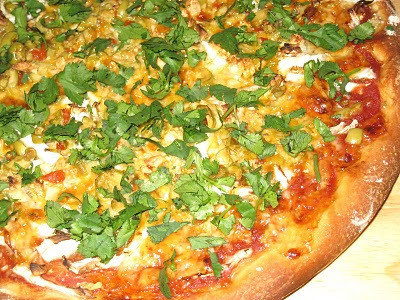 Most of the ingredients were the same I use for regular pizza; I just switched the seasonings and threw cilantro on top when it came out of the oven. I had the last of some napa cabbage I received along with the mustard greens with which I was gifted the week before last (I'm amazed at how long that lasted) and having made okonomiyaki twice already I decided to just throw the rest on top of the pizza. Cabbage matched my Mexican theme pretty well. I wasn't sure it would work out, but I would make this even if I did have mozzarella in the house. Every once in a while I want something different, and this fits the bill. Shape dough as desired for pizza. Spread the tomato around the base, leaving about half an inch uncovered around the edges. Season to taste with the salt. Sprinkle the cumin over, then the oregano. Pinch the oregano between your fingertips to release the oils as you sprinkle it over the sauce. Spread the cabbage evenly over the sauce, then cover with the cheese. Next, spread the olives evenly over the top, and finish with the garlic. Bake on the bottom rack of the oven for 18-20 minutes, until the crust is golden brown and the top is browned and bubbling. 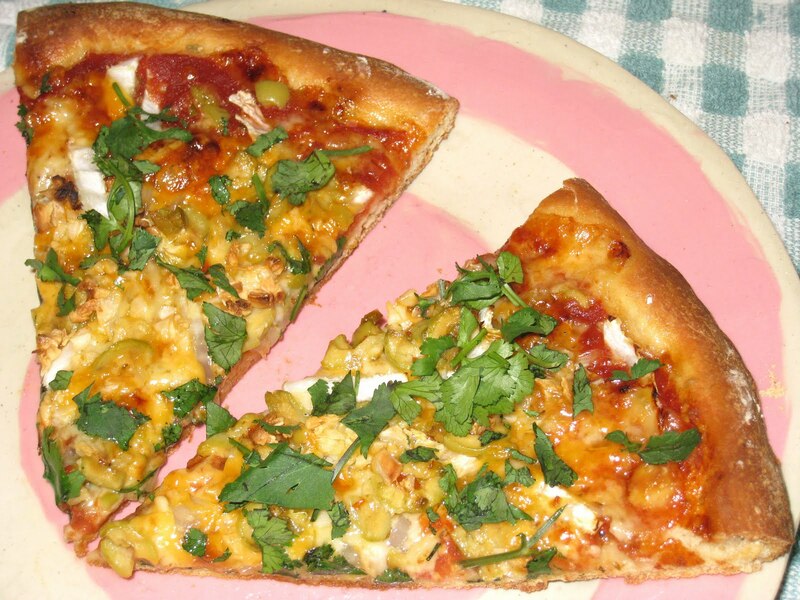 Remove from the oven and spread the chopped cilantro over the hot pizza. Serve hot. Note: These days I make my pizza dough with 1 cup white whole wheat flour, 1 cup bread flour, and 1/2 cup semolina flour, but any combination totaling 2-1/2 cups of flour should work. 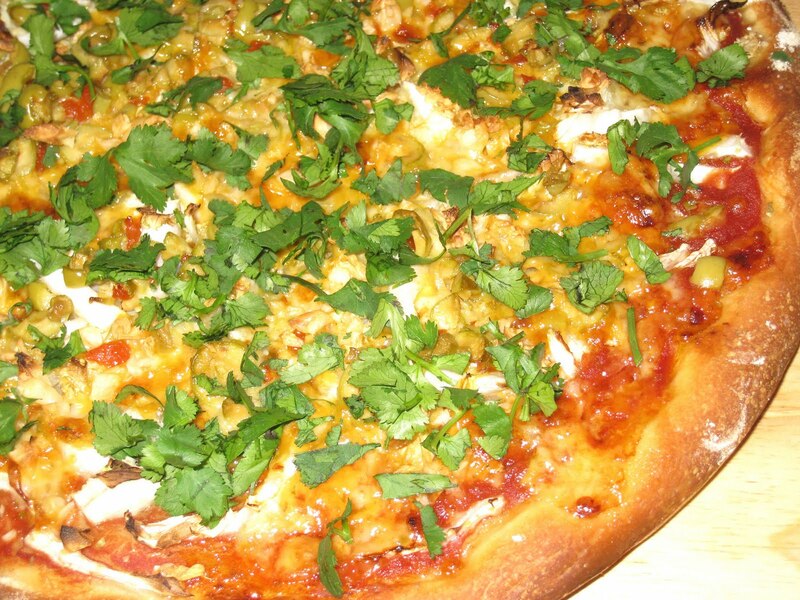 I looove pizza but I really cant wait to try this mexican pizza recipe!